Chromotherapy, widely known as Color Therapy, is the use of Colored light in helping the body to heal. Chromotherapy has been around for nearly 1,000 years, and has benefitted countless individuals. The theory is that your body ‘feeds’ on certain colors within the visible spectrum of light, and that each color is associated with a certain function, feeling, or emotion. 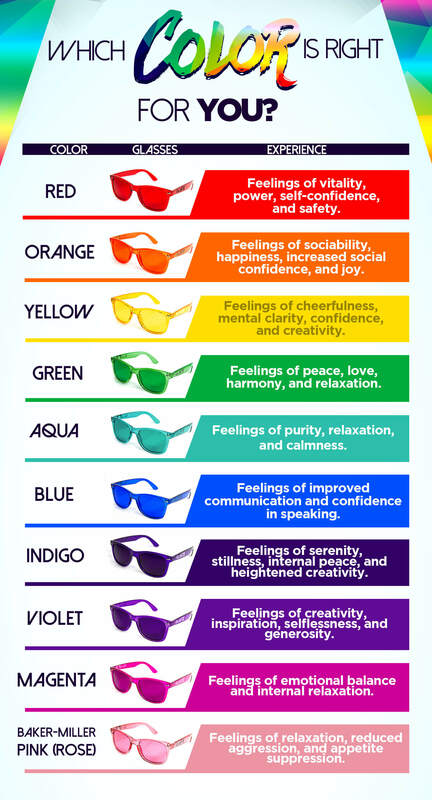 By using our Color Therapy Glasses for 10-30 minutes each day, it is possible to positively impact and regulate your emotions. The color indigo has long been associated with feelings of serenity, stillness, understanding, imagination, and the sixth chakra. It is believed that the benefits of using indigo color therapy glasses include more accurate perception, greater intuition, and heightened awareness. If you are looking to connect more closely with the world around you and raise your awareness, these Indigo Color Therapy Glasses are the right choice. Great high quality glasses. Nice design; very effective for color therapy.